FILE - A Seoungju resident takes part in a protest against the government's decision on deploying a U.S. THAAD anti-missile defense unit in Seongju, in Seoul, South Korea, July 21, 2016. Amid reports that China may be bringing economic retribution against South Korea for the deployment of Terminal High Altitude Area Defense (THAAD), Seoul vowed a swift deployment of the U.S. anti-missile system. Acting South Korean President Hwang Kyo-ahn said Monday his country will move ahead with the THAAD deployment plan because the anti-missile system is a "prerequisite" to enhance the country's defensive capabilities. The decision to deploy THAAD in South Korea came in early July, drawing vehement objection from China, which insists the system would compromise its regional security interests. Some South Korean opposition leaders also are calling for a delay or cancellation of the deployment. The U.S. and South Korea, however, believe the system is necessary to counter growing missile threats emanating from North Korea. The two allies agreed to complete the deployment by the end of this year. FILE - Acting South Korean President Hwang Kyo-ahn speaks during a press conference at the government complex in Seoul, South Korea, Dec. 9, 2016. In response to the THAAD deployment, China has reportedly been deploying economic retaliatory measures against its neighbor since late last year — including capping the number of its tourists into South Korea, restricting the import of South Korean cosmetics, barring a number of South Korean entertainers from performing in China, and rejecting the plan of South Korean airlines to operate chartered flights to China. Chinese authorities also began tax audits and safety and hygiene inspections of the Chinese units of Lotte International. That company owns the golf course in South Korea's southeast county of Seongju that was selected to house the first THAAD battery. Richard Bush of the Washington-based Brookings Institution called China's action "the heavy-handed tactics" to push South Korea to reverse the decision. "This kind of tactics just deepens the fear that many in South Korea have about China's long-term intentions," said Bush, director of the Center for Northeast Asian Policy Studies at the Brookings Institution. "And if China is trying to split, drive a wedge between the United States and South Korea, the impact may be to move them closer together." FILE - A customer tries a lipstick at a shop in central Seoul, South Korea, Aug. 6, 2013. Chinese sanctions against South Korea include restricting the import of South Korean cosmetics. Thomas Karako, senior fellow with the International Security Program at the Center for Strategic and International Studies, said China's indirect, retaliatory measures over the THAAD deployment would only stiffen the resolve of South Korea. He called the Chinese intervention "short-sighted." Karako said that in order to shield itself against Pyongyang's growing threats, Seoul will need to opt for "some kind of defensive capability greater than what is there today," and Beijing's continued interference will only sour bilateral relations. "The THAAD deployment and other deployments to have a defensive means against these threats is a very limited and reasonable response, and China should take that into account," he added. Unidentified U.S. officials on Thursday said North Korea may be preparing for an intercontinental ballistic missile (ICBM) test launch after South Korean media reported movement of what could be components of an upgraded ICBM. The sighting of objects believed to be the lower half of an ICBM at North Korea's main missile launching site was reported by South Korean media Wednesday. 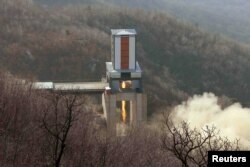 FILE - A new engine for an intercontinental ballistic missile (ICBM) is tested at a test site at Sohae Space Center in Cholsan County, North Pyongan province, in North Korea in this undated photo released by North Korea's Korean Central News Agency (KCNA). Gordon Chang, who writes extensively on China, anticipated that China's retaliation would not last long. "I think though that China is huffing and puffing to a certain extent because they are not going to start a war with South Korea," said Chang, a lawyer and the author of The Coming Collapse of China. When asked how President Donald Trump, who was sworn in Friday, should cope with China's strong protest against the deployment of the missile defense system, Chang said the U.S. should take similar retaliatory measures against China's trade with the U.S. to support South Korea. "It's important for Washington to back its allies on issues that are not only critical to South Korea but to the United States," Chang said. Karako suggested Washington and Seoul should move forward on their mutual interest for defense, irrespective of political and economic pressure from Beijing. "Appeasing China in the interests of easing the tension may not be the right solution," Karako said. "The tension may be resolved only by the Chinese acceptance that defensive measures are necessary." He also advised the Trump administration to accelerate the pace of the deployment plan, given North Korea's fast-growing nuclear and ballistic capabilities. Douglas Paal, vice president for studies and director of the Asia program at the Carnegie Endowment for International Peace, called for the U.S. to ratchet up pressure on nuclear-armed North Korea. "The U.S., together with the ROK [South Korea] and others, should continue calmly to point the finger of blame at North Korea's disruptive weapons development, and the ROK-U.S. side should deploy secondary sanctions against the North," Paal said. Baik Sungwon contributed to this report.